Jupiter and the moon in conjunction on the morning of Sept. 8, 2012. As the moon makes its monthly trip around the Earth, it often appears to pass close to more distant members of the solar system. This apparent closeness, however, is an illusion born of perspective, because the moon is much closer to Earth than any of the other planets, asteroids, or stars in our solar system. This month, there are three apparent close approaches, which astronomers refer to as "conjunctions." In all three cases, the approach is close enough that the moon will appear to pass in front of the other celestial body for some viewers on Earth, which astronomers call an occultation. But why only some viewers? Again, this is the result of perspective or, to be more precise, parallax. Astronomers use parallax to measure the distance of stars, measuring their position as the Earth moves from one side of its orbit to the other. Similarly, if you view the moon from two different spots on Earth, it will appear in slightly different positions in the sky. On the morning of Sept. 8, the moon will appear to pass close to the planet Jupiter. Since Jupiter is very bright, this will be a spectacular sight for most of us on Earth, provided viewing conditions are good. 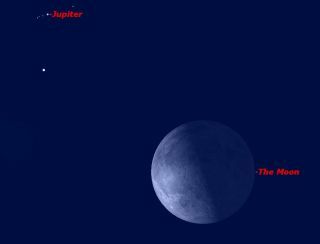 Observers in central and southern South America will see something special: the moon will actually pass directly in front of Jupiter and its moons, blocking them from view for an hour or so. Ceres and the moon in conjunction at 5 a.m. EDT (0900 GMT) on Sept. 9, 2012. The moon will appear to pass in front of, or occult, Ceres over most of North America. The next morning, on Sept. 9, the moon will appear to be very close to the dwarf planet Ceres in the sky. Ceres was the first asteroid to be discovered, in 1801. The massive space rock was originally classified as a planet, then re-classified as an asteroid, and recently re-classified again as a dwarf planet. Unlike Jupiter, which is big and bright, Ceres is small and dim —too dim to be seen with the naked eye. Ceres will be occulted by the moon over most of North America except for viewers in the extreme southeast. The moon will be your guide to finding Ceres. You will also need planetarium software for your computer to show you exactly where and when this event will occur. Some typical times for the beginning of the occultation are 3:44 a.m. EDT for New York, 3:23 a.m. CDT for Chicago, and 1:14 a.m. MDT for Denver. Ceres will reappear from behind the moon at 4:19 a.m. in New York, 4:18 a.m. in Chicago, 2:10 a.m. in Denver, and 1:02 a.m. PDT in Los Angeles. The occultation begins before the moon rises in Los Angeles. Ceres is a dwarf planet, measuring only 592 miles (952 kilometers) in diameter. Even when seen through a powerful telescope, Ceres will look no different than a star; that's why these tiny bodies are called "asteroids." But, pay close attention as Ceres reappears at the end of the occultation. Unlike the occultation of a star, Ceres' reappearance may not be instantaneous, because though the dwarf planet is too tiny to be seen as a disk, it is large enough that its reappearance takes a small fraction of a second. Mars and the moon in close proximity just after sunset on Sept. 19, 2012. After the moon's early morning encounters with Jupiter and Ceres, it will pass the sun on Sept. 15, as the new moon, and has its third close encounter this month on the evening of Sept. 19. This time, the moon will meet up with the planet Mars. Many of you may be surprised that Mars is still visible in the sky. The Red Planet is now far from Earth, moving toward its passing behind the sun in April 2013. Currently Mars is visible briefly right after sunset. As seen from North America, this won't be a very close conjunction, but for viewers in central South America and the islands of French Polynesia, the tiny disk of Mars will actually be occulted by the moon. On Sept. 19, look for Mars just to the right of the thin crescent moon.